Morning shows get to have all the fun! Traffic reporter Dave Kaechele has thrown in the towel, or in this case shirt, on his Fifth-Third Big Burger challenge. 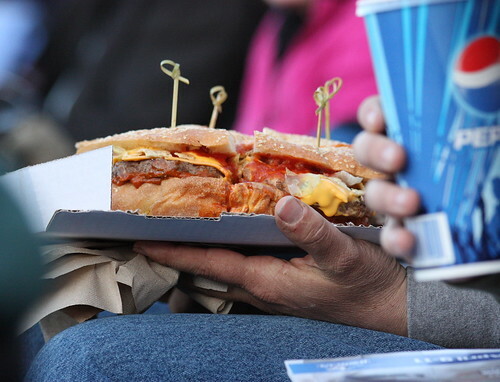 The West Michigan Whitecaps unveiled the Fifth Third Burger on the menu at the ballpark this summer. The burger contains five 1/3lb. burger patties, chili, Fritos, and a load of other items. It contains nearly 5,000 calories, 300 grams of fat, and more than 10,000 milligrams of sodium. Dave Kaechele attempted to devour the $20 burger during the morning news on Friday. He started around 6:00 a.m., but still had at least one patty left by his 7:00 a.m. deadline.